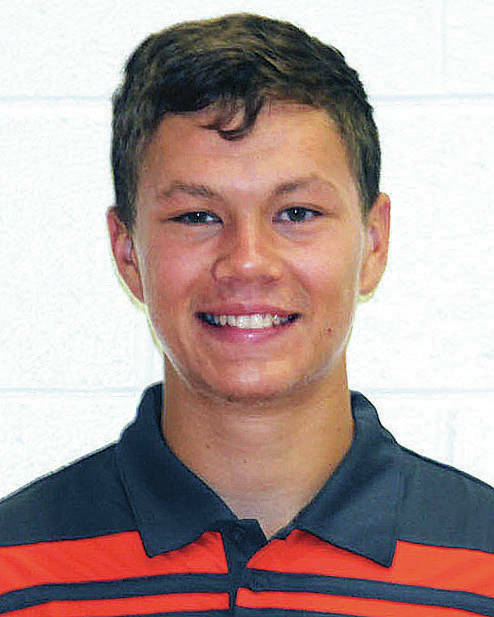 JACKSON CENTER — Trent Platfoot hit a 35-foot shot at the buzzer to lift Jackson Center to a 39-36 victory over Fort Loramie in a Shelby County Athletic League thriller on Friday. It was tight for most of the game. The Tigers led 11-6 at the end of the first quarter but Fort Loramie used an 8-4 scoring advantage in the second to narrow the gap to 15-12 at halftime. The Redskins used a 13-7 scoring advantage in the third to take a 25-22 lead, but Jackson Center stormed back in the fourth to earn the win. Platfoot finished with 16 points while Aidan Reichert led the Tigers with 19 points. Nick Brandewie led Fort Loramie with 11 points while Eli Rosengarten added eight. The Rockets ran away before halftime to earn a SCAL road win on Friday and stay undefeated. Anna led 30-10, 50-19 and 62-32 at the quarter breaks and again had balanced scoring. Riley Huelskamp led the squad with 15 points while Kam Steward scored 12. Griffin Doseck scored 11 points (all in the first quarter) and Carter Elliott also scored 11. Jairon Douglas led Houston with 15 points while Adam Winner added 12. Russia ran away to earn a home SCAL win over Botkins on Friday. The Raiders led 18-17 at the end of the first quarter and 33-30 at halftime. They used a 17-13 scoring advantage in the third quarter to take a 50-43 lead and then finished with a 17-13 scoring advantage in the fourth. Jordan York and Mason Dapore each scored 20 points for the Raiders while Adam Dapore added nine points. Daniel Kearns scored seven points and had 10 rebounds. Jaydon Priddy-Powell led the Trojans with 16 points while Spencer Heuker scored 15 and Zane Paul scored 13. The Jets fought off a rally attempt by Covington and held on to earn a nonconference victory at home on Friday. Fairlawn led 27-14 at the end of the first quarter and 40-27 at halftime. After a 10-10 tie in the third quarter, the Buccaneers closed the gap with a 26-15 scoring advantage in the fourth. Fairlawn made 8-of-14 free-throw attempts in the fourth quarter to help secure the win. Ashton Piper led the Jets with 29 points (including 15 in the first quarter) while Skyler Piper scored 26. The Wildcats jumped out early and cruised to a home Midwest Athletic Conference win on Friday. Minster led 22-14 at the end of the first quarter and used a 9-1 scoring advantage in the second to push its lead to 16 points at halftime. Mike Ketner led Minster with 22 points while Jack Heitbrink added 10. Cody Frericks scored seven points and brought down 16 rebounds. The Wildcats shot 20 for 52 (38.5 percent) from the field and outrebounded New Bremen 42-23. Nolan Bornhorst led New Bremen with 14 points while Patrick Wells scored 12. The Cardinals shot 14 for 53 (26.4 percent) from the field. The Pirates cruised to a home Northwest Central Conference win on Friday. They built a 15-9 lead by the end of the first quarter and extended it to 26-14 by halftime. Kameron Schlumbohm led Riverside with 16 points while John Zumberger added 15 and Wade Auflick scored 12. Auflick, Lane Willoby and Kyle Knight each had seven rebounds. The Pirates shot 30 for 56 (35.7 percent) from the field and outrebounded the Tigers 39-30. The Panthers outscored Versailles 20-11 in the fourth quarter to earn a MAC win on Friday. Michael Stammen led Versailles with 27 points while Evan Hiestand scored 11. The Pirates boys bowling squad finished third in a tri-match with Benjamin Logan and West Liberty-Salem on Friday while the girls finished second. Ben Logan won the boys match with 2,620 while West Liberty-Salem was second with 2,075 and Riverside was third with 1,854. Ian Hughes had a 293 series for Riverside and Spencer Hughes had a 183 game with a 325 series. The Raiders won the girls match with 2,080 while Riverside was second with 2,042 and West Liberty-Salem was third with 1,939. Angela Walters had a 177 game and 318 series for the Pirates while Rayce Yelton added a 194 game.